Why should I buy a smartwatch? Smartwatch has been around for a while, but the boom only started after that successful campaign by Pebble at Kickstarter in 2012. The result today is a long range of smartwatches from different brands tendering to different subsets of consumers. The smartwatch is perhaps the most recognizable gadget in the wearable industry and this growth is majorly driven by lower prices and fitness tracking features as health awareness grows among consumers. Despite the controversial views and equally promising stance on smartwatches over 100 million units of smartwatch was expected to be shipped by the end of 2018. Today, Apple according to IDC holds the major share in smartwatch industry with Samsung, Huawei, Motorola, Gamin, Fossil, Xiaomi all playing critical roles in the smartwatch industry through millions of dollars in investments to meet up with the high demanding consumer space. What we have now, are smartwatches with better designs, longer battery life and increasing number of features. According to Wikipedia, a smartwatch is a wearable computer in the form of a wristwatch. It further states that modern smartwatches provide a local touchscreen interface for daily use, while an associated smartphone app provides for the management and telemetry. Modern day smartwatches are a whole lot smarter than earlier models of the late 80s and 90s, they have Bluetooth for connecting and syncing data from the watch to the phone, in most, inbuilt GPS, optical heart rate sensor are often present and a whole lot of other interesting features. There are also smartwatches that can make and receive calls directly from the watch, this type of smartwatch are regarded as standalone smartwatch. The smartwatch industry is a very dynamic market that is evolving based on newer innovations. One instance is fitness tracking which has become one of the major factors driving the smartwatch boom as a result of increasing health and fitness awareness among consumers. For instance, the Apple watch series 4 is fitness focused and also the first smartwatch to feature an ECG sensor. Smartwatch history dates back to 1972 when the Hamilton Watch Company and Electro/Data Inc. developed the first digital watch, an LED Prototype named Pulsar. The Pulsar wrapped in 18-carat gold sold for $2000. If that sum is equated to today’s equivalent, it should total about $12500. That’s quiet huge. Then in 1983, Japanese firm Seiko released the T001 which featured a portable TV receiver that was linked to the watch and a 1.25 inches screen divided into two separate areas. The top was meant for standard watch features while the bigger screen was meant for video output. In 1994, Timex Datalink co-developed with Microsoft became the very first watch that was capable of downloading data from a computer wirelessly. In 1998, Steve Mann designed and developed the very first Linux smartwatch in which he was rightfully hailed as the father of “wearable computing”. After 1994, there were lots of other contributions from notable companies such as Samsung CSC in 1999 which was regarded as the first standalone smartwatch capable of phone calls. In 2000, IBM revealed a prototype Linux smartwatch called the Watchpad. There was an upgrade to the WatchPad, the WatchPad 1.5 which had an accelerometer, fingerprint sensor and vibrating mechanism. There were other intelligent contributions in the smartwatch history. All trailed by fainted success, not until 2012, when Pebble took the wearable market by surprise through their successful $10 million campaign at Kickstarter which showed major tech companies that there was lots of potentials in the smartwatch. Fast forward to 2018 and now 2019, there are hundreds of smartwatches meeting the demand of millions of consumers worldwide. A fitness smartwatch is one that has all the standard sensors inbuilt ready to track real-time activities. These sensors include an accelerometer, gyroscope, GPS and heart rate sensor. This category of smartwatch is the major contributor to the smartwatch boom as a whole lot of smartwatches fall into this category. The best and most liked fitness smartwatch includes, Apple watch series 4, Fitbit Versa and >,Samsung Galaxy watch. A standalone smartwatch is one that is capable of making and receiving calls directly on the watch independently. Standalone smartwatches take their name from their cellular capabilities. This type of smartwatch normally would have a microphone, loudspeaker and antenna, three components that supports its cellular capabilities. Standalone smartwatches include the Samsung Galaxy watch, Apple watch series 4, Zeblaze thor 4 and Lemfo Lem 8. These are some of the best standalone smartwatches available in the market today which are capable of initiating and receive calls independently with no need for connection to a phone. A Comprehensive smartwatch is one with long range of features which includes both fitness tracking and standalone capabilities. This type of smartwatch has all the standard sensors onboard, can make and receive calls, is swim-proof plus even more features. Two of the best that fall into this category are the Apple watch series 4 and >,Samsung Galaxy watch. As the name suggests, classic smartwatches are smartwatches with the original watch appearance. This type of smartwatches look like the traditional watches. They are best suitable for official outings. They can also be worn for athletic activities or as casual wear. Samsung Galaxy watch and Ticwatch C2 are two typical examples of classic smartwatches. This type of smartwatch often has casing made of stainless steel, silver or aluminum. A sport smartwatch is a smartwatch with a sporty and flashy appearance suitable for use in athletic activities or as casual or informal wear. Two fantastic examples are Apple watch series 4 and Fitbit Versa. This type of smartwatch is light weight as the body is mostly made of thermoplastic and silicone bands. A hybrid smartwatch is a smartwatch with analog display and also has smartwatch capabilities. This type of smartwatch has analog display with mechanical hands just like the traditional watches. Hybrid smartwatch had to be produced as a result of divergent views from consumers who didn’t like the digital display. Notable names such as Fossil and Michael Kors have a range of fine classical hybrid smartwatches. Some of the best hybrid smartwatches includes, LG Watch W7 and Withings Steel HR Sport. Smartbands also called Smart bracelet are wrist-worn activity trackers with limited smartwatch functions. Smartbands were the most sort after wearable in the early boom of the smartwatch industry and not until 2018 did smartwatches become more popular due to the lower prices of smartwatch and greater value. Smartbands get their name from their appearance and activity tracking features. A typical smartband looks more like a bracelet than a smartwatch and with one or more sensors for activity tracking. A typical example is the MI Band 3 which one of the cheapest smartbands. Luxury smartwatch as the name suggest are the most expensive type of smartwatch. Irrespective of design and functions these types of smartwatches are generally expensive. Some of the best luxury smartwatches include Montblanc Summit 2 and Tag Heuer Connected 41. Modern day smartwatch can do quiet a whole lot of things, it’s an advancement beyond the basic functions of a watch. The whole idea from onset was to get technology into smaller vessels, today, what an average smartwatch can do is far beyond what the pioneers ever thought. The modern day smartwatch has not drifted away from the basic function of a watch which is to tell the time. A smartwatch tells time in a different way from the traditional watch except for hybrid smartwatches which have analog display. Most smartwatches use digital display to tell time, the most popular ones are LCD, OLED and AMOLED technologies which includes monochromic and multi color display types. Multi color display technologies are more lively and interactive, but at a cost on the battery life. Smartwatches have watch faces that can be changed, there are lots of watch faces available on Google play store and other app stores. A smartwatch owner can choose to change the appearance of the watch face. This feature allows the user to define his/her style for any occasion. Modern day smartwatches have sensors built into them, these sensors can automatically detect a user motion and will track the activity. Just like smartphones, standard sensors found in a smartwatch includes; an accelerometer, gyroscope, heart rate monitor and GPS sensors. An accelerometer in a smartwatch is able to detect linear motion and as such can track steps, calories and sleep. Counting the number of steps you take in a day and tracking your sleep patterns is one of the functions of a smartwatch. A gyroscope detects rotational motions in three different axes. An average smartwatch will have gyroscope sensor inbuilt which can track your cycling activities and other rotational movements. Almost every smartwatch available today come with a heart rate sensor. What this sensor does is to monitor your heart rate and from the result you can know if youre exercising within your limits. The HRM as it’s fondly called helps you achieve the best performance in in your workout. The GPS sensor is inbuilt in most smartwatches, its function is to help you track outdoor activities such as the distance left or covered, you can track routes you take or took as well as locations. It’s one of the vital sensors you will find in a smartwatch. Beyond the four basic sensors mentioned above, there are other sensors included in modern day smartwatch. Like the altimeter which measures altitude levels and comes very handy for avid hikers, climbers and pilots. You will also find a barometer sensor that measures changes in pressure, and in some a thermometer to track temperature changes. The most recent is the ECG sensor found in Apple watch series 4 that lets you take electrocardiogram test right from your wrist which helps you record atrial fibrillation (AFib) a form of irregular rhythm. It’s very likely that we will see more sensors built into smartwatches in the near future. Although there are quiet some controversies steered from doubts on the accuracy of these sensors, but they do give a picture, some motivate you to keep fit and better still tech giants are investing a lot to improve on what’s on ground. 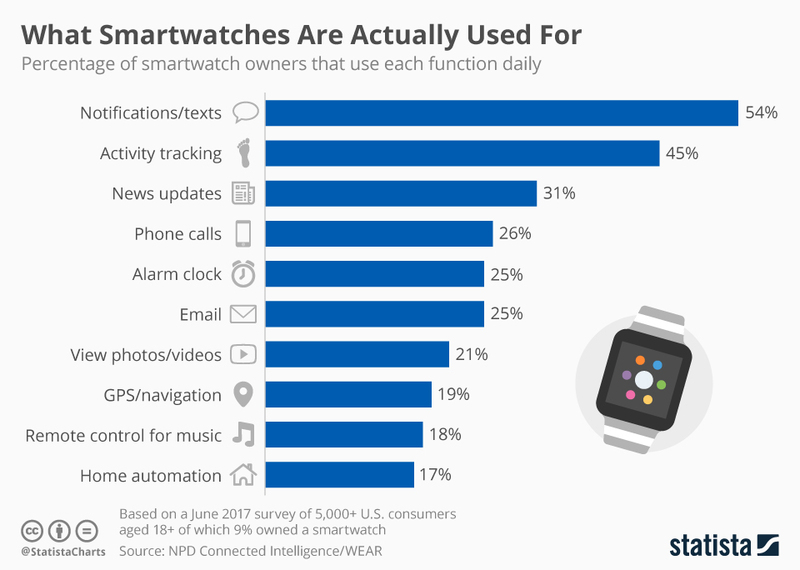 Smartwatches help you stay connected.A graph from Statista showed that major percentage of consumers buy smartwatches to keep them connected and updated. Smartwatches were originally built as companions for phones, although standalone smartwatches can work without a phone. When a smartwatch is connected to a compatible phone, it is able to sync data effortlessly and will buzz you when there is a notification from your phone. This one feature business inclined personalities find very helpful. In a world where time is so precious making maximum use of your time is very important. Smartwatches help you save time and achieve more. For instance, quiet a lot of smartwatches have NFC inbuilt which lets you make payments on the go from the watch. Most smartwatches come with onboard storage space as a result smartwatches are fast becoming entrainment hubs. You can play or download media files, access Sportify or other media apps on the go. This feature comes handy while working out. You can’t conveniently carry your phone with you during workout sessions. The smartwatch industry is dynamic and the modern day smartwatch is evolving. New features are added at a fast pace, this possibly accounts for the millions of dollars in investment from tech giants. A digital watch face for displaying the time, notifications received and other complications. Inbuilt sensors for activity tracking. NFC chip for mobile payment. WiFi, bluetooth or both for connecting to nearby devices and initiates notifications alert on the watch. Microphone for accessing voice command. Loudspeaker that lets you play media files anywhere. Standalone smartwatch support cellular connectivity for calls and internet related functions. Some smartwatches like Lemfo lem 8 come with camera that lets you capture captivating moments from the watch. In the future more interesting features are likely to come to smartwatches. To elaborate further on the features of a smartwatch, let’s take a look at the features of the Samsung Galaxy watch. The round screen measuring 1.3 inches uses super AMOLED technology for displaying complications. It is touchscreen and has physical buttons. The upper one represents the back button while the lower one is the home button. The bezel is rotatable, makes navigating the interface a lot easier. The 46mm case is made of stainless steel while the 22mm strap is made of silicone. These straps can be changed if you don’t like it or just want to spice things up a bit. There are also lots of preloaded watch faces to choose from, each with a distinctive design. On the screen is a Corning Gorilla glass that’s resistant to scratch. Samsung galaxy watch has an accelerometer, gyroscope, barometer and heart rate sensor for tracking wearer’s activities. Its rated 5ATM and as such waterproof up to 50 meters. Inside the Galaxy watch is Exynos 9110 chip that controls the hardware workings of the watch. It runs on Tizen OS, Samsung’s proprietary operating system that now powers many of their smartwatches. The galaxy watch has Wifi, Bluetooth for connecting and syncing of data plus inbuilt GPS sensor for tracking outdoor activities. The Galaxy watch also has NFC chip inbuilt which supports Samsung pay for mobile payments. The Galaxy watch supports cellular connectivity, calls can be made from the watch and as well receiving of calls on the watch. This makes it a standalone smartwatch that can work solely without connecting to a phone. The Galaxy watch has 4GB ROM onboard storage space, music, videos and other files can be stored on the watch. There is a microphone and loudspeaker inbuilt which makes it possible to access voice command and play media file directly on the watch. Inside the 46mm version of the Samsung Galaxy watch is a 472mAh lithium polymer battery that is rechargeable via a WPC wireless charger that comes with the watch. The battery last about 4 days or more on regular usage. A video that illustrates the features of the Samsung Galaxy Watch. From the table above its very obvious that the smartwatch has more features than a traditional watch and as such offers far more economic value. People want more value for their money, this one reason why the smartwatch market have grown rapidly since the first one was released in the late 70s. One evidence to back this claim is in the fact that Apple alone sold more watches than the whole Swiss watch industry. This inevitable scenario was rightly forecasted by renowned names in the fashion industry such as Fossil who went ahead to release smartwatches and hybrid smartwatches for those who can’t part ways with the look and feel of traditional watches. The modern smartwatch can do a whole lot of things beyond just telling time. It only gets better with the smartwatch. There are many reasons why you should buy a smartwatch, but first we would start by asking why people buy watch in the first place. Most people buy watch to help keep them updated with time even though they could do that with a phone. Beyond that other people see watch as a priceless piece that represents their personality. Some watches even last so long that it becomes a family heritage and is passed beyond one generation. Its same reason why you should buy a smartwatch. A smartwatch offers far more value than what a traditional watch can do. There is a smartwatch for everyone, if you don’t want it all digital, you can go for a hybrid smartwatch which look and feel exactly like traditional watches. It looks clear that in a matter of time traditional watches would be relegated to history. Smartwatches offer quiet a lot of benefits to its wearer, beyond the sophisticated and fascinating design, a watch will keep you connected to your world, entertains you, and wants to help you live a healthier life by tracking your activities and encouraging you to achieve more fitness goals. As reported by Lisa Fickenscher, sales of watches decreased with the advent of smartphones , but with the boom of the smartwatch industry, its clear millions of consumer find it very useful. Just like a traditional watch, a smartwatch still tells the time, lets you set alarm, show calendar. There are quiet a whole lot of complications that can be showed on the screen of a smartwatch at once. There are watch faces of various types to choose from, the benefit is that it allows you change and define your style for any occasion. Really there are lots of awesome watch faces to choose from. Staying fit and healthy is a responsibility and there is no better way to do that than wearing a flexible and fascinating watch on your wrist that can track your activities. Most smartwatches like the Samsung Galaxy watch, Fitbit versa or Apple watch series 4 come with all the standard sensors inbuilt. The HRM sensor can detect and track your heart rate, thus helping you decide to increase or decrease exercise rate according to your body. How about the VO2 Max feature in Fitbit Versa that helps track cardiovascular fitness level. A smartwatch can detect sedentary moments, and will remind you it’s time to work. It can track your total steps for the day. The smartwatch is also a great choice for avid swimmers who like to track their swimming activities. Your phone can help track your activities, but a smartwatch offers more accurate tracking and flexibility. Think how uncomfortable it would be to carry your phone in your pocket while cycling. Apple watch series 4 had the ECG inbuilt that lets you take electrocardiogram test right on your wrist to help detect Atrial fibirillation, a form irregular heart rhythm. The ECG sensor is also coming to Withings Move ECG set to be released soon. It’s clear that as time goes on we would see more health related features on smartwatches. A smartwatch can entertain you, most smartwatches have onboard storage space that lets you store media files on the watch. You could listen to your favorite tracks on the go via a Bluetooth enabled headphone or earbud while working out, traveling or just recreating. You can do just that with your phone, but you should think how inconvenient it would be carrying your phone while running or other activities. Some smartwatches like the Lemfo lem X has a 2.0MP camera for capturing captivating moments. Others have loudspeaker that lets you play media files anywhere. A smartwatch can make you more efficient, take for instance the Bixby feature on Samsung Galaxy watch that automatically does what you tell it after a voice command. There is a “find my phone” feature on the Galaxy watch that can help you find a lost phone by ringing it even if it’s on vibration. Some smartwatches can help you control your smarthome easily, like help switch the TV off. The original concept behind smartwatches was to serve as a perfect companion for your phone, although standalone smartwatches extend their functionalities beyond being mere companions for phones. Smartwatches have bluetooths and sometimes Wi-Fi or both which lets you connect to a phone and its able to sync data from the phone. Off course, you can simply bring out your phone and take a gaze at notifications, but with a smartwatch you do that faster and conveniently especially when you find yourself in a heavily crowded commute. When a smartwatch is paired with a compatible device, it’s able to alert you upon the arrival of new notifications from your phone such as incoming calls, email, event reminder, when your Uber is arriving and other form of updates. A smartwatch keeps you connected to what matters. Short battery life has remained one the biggest disadvantages of a smartwatch. Most smartwatches have on average 1-2 days of battery life on mixed usage. You might have to charge a smartwatch at least once every day. Although there has been tremendous improvement in the battery life of most smartwatches. The Samsung galaxy watch has an impressive battery life of about 3-4 days on mixed usage. Hybrid smartwatches generally have the longest battery life. Withings Steel Hr Sport has over 30 days of battery life on regular usage. Smartbands also have long battery life, since they tend to have fewer features than a full-fledged smartwatch. The MI Band 3, a fantastic smartband has over 15 days of battery life on mixed usage. Battery life of the smartwatch has improved a lot and it can only get better with more efficient and advanced chips, processors and algorithms. On average smartwatch prices is on the high side, but price is falling fast as more smartwatches from China continue to flood the smartwatch market. The Lemfo Lem 8, Ticwatch Pro and Amazfit Verge are some fantastic smartwatches that don’t cost a fortune to acquire. For me, what makes a smartwatch a good one can only be defined from the buyer’s viewpoint. Every smartwatch buyer certainly would have a focal point that draws more attention to him/her. It’s this focal point in terms of preferences that determines what type of smartwatch you finally decide to buy. Have an impressive battery life. Can accurately track my activities. Helps me stay connected to what matters. Not too thick or bulky and at same time light weight. Entertains me on the go. If you were going to buy a smartwatch, you certainly would want the perfect one. The smartwatch that looks great on Harry wrists might look awkard on Smith. How does the smartwatch look? The appearance of a watch matters a lot, smartwatches are available in various shapes. Some look sporty while others look classic. So which do you want, classic or sporty. For the business guy, a classic smartwatch such as Samsung Galaxy watch would look great for official outings, while an athlete would prefer the Apple watch series 4 or a smartband. You don’t want it to be too bulky or thick on your wrist. For ladies, the thinner and smaller the case the better. What feature(s) do you want to see on the watch. If you are the guy that works at the Wall Street, you certainly would like a smartwatch that has both Bluetooth and Wi-Fi to help keep you updated. Perhaps you are a climber, then your smartwatch should have an altimeter to help measures altitude levels. Fitness enthusiasts would like a smartwatch that can accurately track their activities. Some smartwatches might be fitness focused while lacking other features. Others can be fashion focused while lagging in activity tracking. The Samsung Galaxy watch is a comprehensive smartwatch that looks both stylish and elegant plus has a whole lot of fitness tracking and other features inbuilt. The very first thing you should do before buying a smartwatch is to check if it will work with your phone. Most smartwatches are compatible with both Android and iOS devices, but you should check what versions of Android and iOS devices are supported. Google makes it easy to check if your smartphone is compatible with a Wear OS smartwatch. Hybrid Smartwatch, Full-fledged Smartwatch or Smartband? You have to decide on the type of smartwatch you want. Smartwatches occur as full-fledged, this type have complete digital screens and can be classic or sporty in appearance and are the most abundant in the market. These types of smartwatches have more features than both hybrid smartwatches and smartband. They are the most comprehensive and no doubt gives more value for money as consumers buying choice indicate. The Samsung Galaxy watch is a full-fledged smartwatch, likewise Fitbit Versa, and Apple watch series 4 are just a few examples. A Hybrid smartwatch has analog display just like traditional watches, sometimes there can be a smaller digital screen to display tracked metrics and notifications. Hybrid smartwatches mostly have classic appearance. For people who don’t fancy the geeky appearance of a full-fledged smartwatch, the hybrid smartwatch becomes a nice alternative. However, most hybrid smartwatches have lesser features compared to full-fledged smartwatches. Smartbands on the other hand are mostly fitness trackers with notification capabilities, they look more like bracelets and don’t look like a watch. Some Smartbands can have same function capability with a smartwatch, but appearance is the major difference. Smartbands are generally cheaper than a smartwatch, but have lesser features compared to smartwatches. Smartbands are great choices if you just want something to track your active life and also keep you connected. So, you should decide what type of smartwatch you want to buy, the Hybrid one, full-fledged or a smartband. You should check the appearance of the watch, take note of the shape. Do you want a classic or sporty kind of smartwatch. Classic smartwatches are generally circular, while the sporty types can have thermoplastic case and most often square or rectangular in shape. Check if its touchscreen or not and what other input method is available. The Samsung Galaxy watch is touchscreen and has rotating bezel that makes it really easy to navigate the interface plus two buttons; the back and home buttons. Weight matters, if you like the watch, you will most likely want to wear it often, but it becomes practically impossible if the watch is too heavy. The Apple watch series 4 is remarkable for its light weight. It weighs just 48 grams for the 44mm version which is really amazing for a smartwatch with so many features. You should check the size, what is the case size and strap size. For women, anything below 44mm will look great. Check the width and length of the strap. It shouldn’t be too bulky or long. Some smartwatches might have sensors built into the strap, thus rendering it irreplaceable. Though, this accounts for more accurate tracking result, but doesn’t allow you define your style. The Ticwatch S has GPS sensor built into the strap which makes it irreplaceable. Is the Watch Face Interchangeable? Although most smartwatches have interchangeable watch face, but hybrid smartwatches have analog watch face that can’t be changed. So you should check that and decide on which you prefer. You should check what the waterproof rating is. Most smartwatches have IP67 rating which means water resistant up to 1meter, while IP68 means water resistant up to 1.5. Samsung galaxy watch has 5ATM rating which makes it water resistant up to 50meters. Some smartwatches like the Garmin Quatix 5 has 10ATM waterproof rating. Some other smartwatches are rated IPX7 which means dust and water resistant up to 1 meter. Every smartwatch will have a Bluetooth for connecting and syncing of data. However, some have both Bluetooth and Wi-Fi. This keeps you connected even when your phone is not with you. Comprehensive smartwatches like the Samsung Galaxy watch has Bluetooth, Wi-Fi and also supports cellular connectivity which makes it a standalone smartwatch. What Fitness Tracking Features are Present? You should check what sensors are onboard and what can be tracked. If you’re fitness conscious, you will want to know if there is HRM, accelerometer, gyroscope, GPS and other sensors. For a climber, you want to be sure there is an altimeter. Samsung Galaxy, Apple watch series 4 and Fitbit Versa are some of the best for fitness tracking. You should check if the smartwatch would make a perfect companion for your phone. Smartwatches and smartbands have nice notification features built-in. Wear OS smartwatches enjoy the redesigned wear OS 2.1 which added a notification stream that lets you see more updates at a glance. Generally smartwatches suffer short battery life, however there has been immense improvement which has seen many smartwatches come with longer battery life. You should check the battery life capacity and rating. The Samsung Galaxy smartwatch has about 3-4 days battery life. Standalone smartwatches have cellular technology inbuilt that enables the watch to place and receive calls independently without connecting to a phone. Some people don’t like more features, so you can skip this. Can I Store Files on the Watch? You should find out if the watch has onboard storage space available. Most smartwatches have considerable memory storage except for some smartbands which have very little memory space. By being able to store files in the watch, you can listen to your favorite tracks on the go. This might be very important for some people, you want to check if there an NFC chip onboard that allows for contactless payment system on the watch. The Samsung Galaxy watch has NFC chip onboard that supports Samsung Pay. If you find a smartwatch you like, you can proceed by comparing prices to find the best deals. Most mainland Chinese smartwatches cost cheaper compared to their Europe and US counterparts. What other Features are Present? Smartwatch technology is evolving and it’s likely we will see more features built into smartwatches. So you might want to know what other features are present on the smartwatch. Some smartwatches have loudspeaker, microphone or both. Samsung Galaxy watch has both loudspeaker and microphone. You should check the companion apps too, is it robust and helpful. In addition to the items mentioned in the general checklist above, a woman’s smartwatch has specific criteria as far as appearance of the watch is concerned. Shopping for a smartwatch for women, the first step is to ask what type of smartwatch you want to buy. It could be a classic or sporty smartwatch or a smartband. Classic smartwatches look fantastic for official outings while the sporty ones and smartband would be great for casual outing or workout sessions. The color of the smartwatch matters, you should check the available colors. For women, the brighter and lighter the better. Colors like gold, rose, rose-gold, silver, pink, and violet are the best choice for women. The rose colored Samsung Galaxy watch is a fantastic choice for women. You should check the various sizes. The smaller the better for ladies, I normally recommend anything below 42mm for women. The Samsung galaxy watch smaller version measures 42mm and it’s a fantastic choice for women. Check the thickness, if it’s too thick it will definitely be too heavy and will add to the bulkiness of the watch. I recommend thickness below 12.5mm for women. How wide are the straps, most smartwatches come with 18mm, 20mm or 22mm strap sizes. I usually recommend 20mm and 18mm for women because the thinner the better and the sexier and smart it looks on your wrist. Can the Straps be Changed? You don’t want to be stuck with straps that are irreplaceable. Interchangeable straps are better as it lets you define your style for every event. Smartwatches for men look quite different from that meant for women. There are certain physical appearance features that characterize a man’s watch, but first you should decide on what type of smartwatch you want to buy, a full-fledged one, hybrid and just a smartband. Once you have decided and in addition to the general checklist above, you should check the appearance. Smartwatches can come in classic or sporty design for smartwatches and bracelet design for smartbands. For fitness enthusiasts, you will want a smartwatch with sporty design, while on the other hand, classic smartwatches look great for official outings. However, what you choose to wear for any occasion depends on your style and personality. For men, elegant and bold is the perfect choice. For men, sizes are quite different from that of women. Smartwatch for men come in 42mm, 44mm, 46mm or bigger, but it depends on your wrist size. You should choose based on the size of your wrist. Also check the strap sizes, for men 20mm, 22mm will look great. However 18mm will great for very small wrists. So choose based on your wrist size, but the wider and bolder the better for men. Most smartwatches come with interchangeable straps, however some have irreplaceable straps. Interchangeable straps are better, it ensures you get to define your style and can use the watch for quite a long time especially when the strap that came with the watch gets damaged. There are a zillion number of reasons why you should buy a smartwatch for your kid and if you choose to, it will be wise to make the right choice. There are specific features that characterize a smartwatch meant for kids. These includes, inbuilt GPS, support for calls, ability to set restrictions and the physical appearance are some features to look at for. The appearance matters, you should check the material used. The size and color. 38mm to 46mm are the right case sizes for kids while brighter colors like pink, purple seems to go well for kids. Also check what the casing is made of, silicone is mostly used and is very safe in terms of radiations emissions. The watch should also be light weight. One of the main reasons why parents buy smartwatch for their ward is to stay in touch, so you should confirm the watch has support for SIM for calls and which carriers are supported. Subscription can be pre-paid or on contract. SOS is an emergency call feature common to many smartwatches for kids. In times of distress a kid can press the SOS button and parent gets an alarm notification for the number that was preset with the watch during setup. It’s a very important feature to look out for. Smartwatch for kids normally come with inbuilt GPS that enables the effortless tracking of outdoor activities. Some support a multi navigational system that ensures even further accurate trackings. With inbuilt sensors, parents can know the location of their ward. Some Smartwatches for kids have camera, this enables him/her to capture captivating moments. This can be fun for kids who like to capture their every adventure. So you should check if the smartwatch has a camera. For a kid smartwatch, installed games can help make the watch more interesting. Most smartwatches for kids have lightweight games installed which can be fun and keeps them busy. The smartwatch market is a huge one that is increasing at a fast pace. It’s a big family of highly recognized global tech brands. Apple is the biggest name in the smartwatch market, enjoys the biggest share in the market. Their latest smartwatch is the Apple watch series 4which turned out to be one of the best smartwatch in 2018 and also the first smartwatch with an ECG sensor. Samsung is one of the biggest brands in the smartwatch industry. I can tell they have done so well with their smartwatches grossing hundreds of thousands in sales. The Samsung Galaxy watch is one of my favorite. I like this watch, from the design to performance is awesome. It’s a fantastic choice and a great alternative to the Apple watch 4 especially for those who don’t own an iPhone. Fitbit is notable for their huge strides in the fitness tracking business. Their smartwatches and smartbands are some of the best selling in the fitness tracking market. The Fitbit Versa remains one of their most outstanding timepieces. A whole lot is right about the Versa, the design is fantastic, fitness tracking accuracy is remarkable and battery life is also great. Mobvoi, still sticking with Wear OS even when the likes of Samsung and Xiaomi looking elsewhere isn’t doing bad in the smartwatch market. Their smartwatches are some of the best. The Ticwatch S2 and E2 are two great choices for a comprehensive activity tracking. I recommend the Ticwatch E2 for women and the Ticwatch S2 for men. The Ticwatch PRO is another great choice from Mobvoi, the innovational double screen mode is one the major highlights on the watch design that has seen it become a popular choice among smartwatch consumers. Fossil is another brand that has made some giant stride in the smartwatch market. Their Gen 4 smartwatches are awesome. The Gen 4 Explorist which runs on Wear OS 2.1 is recommended for men while the Gen 4 Venture a classy and stylish smartwatch is highly recommended for women. I like to call them the king of GPS trackers, Garmin is one of the notable brands in the smartwatch market that has endeared their smartwatches and smartbands in the hearts of a huge number of consumers. Its one of the most popular brands among US residents. The Garmin Fenix 5S plus and Forerunner 645 music are two great choice I highly recommend. Xiaomi in partnership with Huami is another top brand in the industry. Their a-list of smartwatches include Amazfit Bip which turned out to be one of the best low budget smartwatch and is actually very popular too, Mi BAND 3, a fantastic smartband for fitness enthusiasts with great design and performance and of recent the Amazfit Verge, now trending is another great choice for fitness enthusiasts. Huawei is another top brand in the smartwatch market that has carved a niche in the industry. The Huawei Watch 2 classic is one of their best smartwatches and is also one of my favorites. Other notable names include Michael Kors, Montblanc, Tag Heuer, Withings, LG and Zeblaze, but these are just a few of the increasing number of smartwatch brands in the smartwatch market. In conclusion, there is no gainsaying that the smartwatch is here to stay judging from the bullish trend in sales over the last few years. The dynamism of the smartwatch indicates there are rooms for more innovations. In 1972 it was the Pulsa, fast forward to today, we have the Apple watch series 4 that has an ECG sensor, and there will be other innovations of great value in the nearest future as tech giants in the industry battle to outrace each other. This then leaves us with a smartwatch industry that’s real big. Go get yourself a smartwatch, there is absolutely no reason to be stuck in the past. The modern day smartwatch is very smart and really is of immense value to the wearer and the good thing is there is a wide variety to choose from. No matter your personality and style, there is a smartwatch for you, if you don’t like it geeky, there are lots of fantastic hybrid smartwatches to choose from. The Swiss Watch makers understand this perfectly well which is why notable traditional watch makes have started taken their chances in the smartwatch industry. It’s true that the smartwatch industry has its challenges; limitations in design, shorter battery life and the fact that we are yet to see a real app aside from the fitness community and competition apps from fitness trackers, but there is no doubt that a huge number of people who like wearing watch are buying smartwatch. According to Statista, the global sales of smartwatch are expected to reach 141 million units by 2018. It was 19 million units in 2015, that’s a tremendous growth, evidence that a whole lot of people like smartwatch. Top best smartwatches to buy in 2019.